Jupiter, Fla., Nov. 9, 2013 – This time Cinderella wore blue, spoke with a distinctive dialect and was playing for the memory of a dear friend. The Yankees, hailing from Long Island, had sent teams to the Fall Classic for 13 years without making a championship game appearance, let alone winning a title. 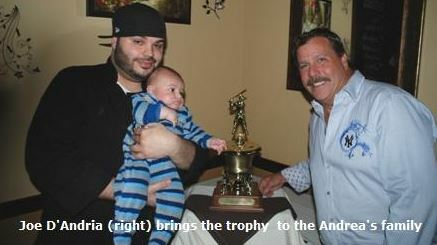 This year in the 52+ American division, changing their name to Andrea’s in remembrance of close friend Andrew Sorrentino, the father of a family owned restaurant chain in New York State who died in 2009, the Yankees finally earned their rings.”It’s been a lot of years, a lot of teams and a lot of preparation,” Andrea’s Yankees manager Joe D’Andria said. “[The restaurant family] has always taken care of us, so we wanted to do this for them. Thanks to an import from Chicago, and a four-run first inning, the long wait for a championship is finally over. Alden Stiefel, who plays in the Chicago MSBL and had just won a championship in Arizona, pitched a six-hitter and retired 15 of the final 16 hitters in a 7-3 victory. For D’Andria, there was never a doubt about who would get the ball for the title game. “We lost so many pitchers before the tournament that we had four guys left and one who could throw the ball,” he said. “I knew we had a great offense and good defense, so it was going to come down to pitching for us. Chuck Korn, Jerry Diliberti, Bruce Grossman, Cory Levy and D’Andria led off the game with consecutive hits with Levy’s single and D’Andria’s double plating three runs. An RBI ground out plated another and suddenly, the team that had never sniffed a title game appearance was ahead, 4-0. Levy, who finished 3-for-3 with a single, double, triple and drove in another run in the third for a 5-1 lead, was named co-MVP with Larry Zackman, whose two-out RBI single to right in the eighth pushed the advantage to 6-3 and quashed hopes of a Long Island comeback. For the Long Island Yankees and manager Bernie Ellison it was the fourth championship game loss in four years including three losses – 2010, 2011, 2013 – at the Fall Classic. It also came just weeks after the team lost in the 50 Central championship game at the MSBL World Series in Arizona. “They took advantage of their opportunities and we didn’t,” Ellison said. “I thought [losing pitcher Bob Seroski] did a great job of settling down after that first inning. Andrea’s Yankees reached the finals on the heels of a 4-0-1 round robin record and playoff wins over the Montgomery Yankees (17-5) and Long Island Athletics (12-1). The top-seeded Long Island Yankees were 5-0 in round-robin play before defeating the Palm Beach Tropics (9-2) and Austin Express (11-3) in the playoffs. When the hugs had been shared and the championship photos taken, D’Andria knew there was only one more matter of business to handle.